If you’ve ever clicked on the links at the bottom of the sidebar on the left, you’ve probably realized that a) my last name is Shopsin, and b) my family owns a restaurant in New York City called, you guessed it, Shopsin’s. The restaurant has been a fixture in my life since the day I was born. Literally. I’ve lived in a number of apartments and houses, but the restaurant (now in it’s third location) has always been the place I called home. Our restaurant is very hard to explain, though that doesn’t keep people from trying. Google it and I’m sure you’ll find a ton of people that love it, hate it, are disgusted by it, are shocked and awed by it, or just plain like eating there. One thing I think people will agree on is that the menu is huge, incredibly varied and incredibly weird. The two things I’ve seen people ordering the most of lately are Macaroni and Cheese Pancakes, which sound weird, but are truly awesome, and the Gallant sandwich (warm turkey, bacon, avocado, cranberry mayo, ciabatta) which almost sounds normal and again, is quite delicious. You can look at the full menu here (pdf). A warning: When I was still living at home, before going off to college and my stay on the west coast, I used to design the menu for my dad. My designs were not particularly inspired, but they were relatively readable and consistent. When I left for college I gave my dad a copy of Quark Express and a brief tutorial on how to use it. And use it he did. I haven’t studied Claude Shannon’s work on information theory as much as I’d have liked, but I’m pretty sure his menu design is approaching some sort of maximal information density limit. 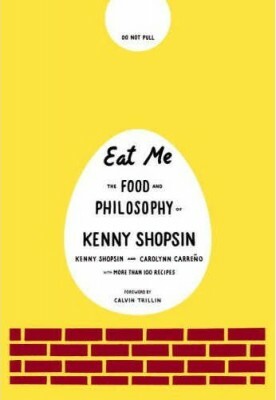 Anyway, the reason for this post is that my father recently released a cookbook/philosophical tract/memoir called “Eat Me: The Food and Philosophy of Kenny Shopsin”. I’m obviously quite biased, but I think it is the most entertaining cookbook I’ve ever read. It’s a combination cook book and memoir, with about 100 recipes and a bunch of essays detailing my father’s approach to food, cooking, family, the restaurant business, and much more. Not to mention a picture of me bathing in a sink. You can read it like a cookbook, just going to the recipes that interest you, but I think most people will just end up reading it cover to cover like a normal book. The book is designed by my sister Tamara and the photographs were taken by her husband Jason. Amazon Page for I Like Killing Flies , a 2002 documentary about the restaurant.